Despite the latest korean bingsu food dad, the yoghurt craze seemed to have taken Singapore by the storm, to the extent that even buffet now includes a self-service yoghurt soft serve section. It has been years since my last visit and Royal Carousel has undergone some renovation to sport a new modern chic look. With less than an hour to eat during my lunch visit, I wasted no more seconds and dived straight to the buffet section. In the busy Shinjuku station which sees the most number of commuters each day, few may know that there are actually TWO matcha shops that serves takeaway sweets. The first is Mame Torou which specializes in using tofu with tea. This offshoot sweets outlet is produced by Saga Par, a soft serve shop along Arashiyama streets which claimed to be the first shop that sells soy bean soft serve. True or not, the triple soft serve (500 yen) does a good job with leveraging the nutty soy qualities of the bean but for a stronger matcha kick and a creamier mouthfeel, I prefer the one from Cha no Ikedaya (below), a shop which has been around in Shinjuku station area for more than 70 years. Yogurt soft serve or whatever Bingsu won't get me excited as much as the classic pastries. I have a "bad" habit of peeping at pastries whenever I walked past a boulangerie or a patisserie, just to see if there is any new creations. So by luck or by fate, I spotted some new cakes from Maison Kayser and they looked so promising that I could not walk away without buying them to try. ALL were fantastic and the pastries, on the average, fared much better than my previous visit. This is especially true when it comes to THAT Royal Chocolate (Dark Chocolate, Hazelnut Mousse, Crunchy Feuilettine). Crisp yet smooth and fine, it is the perfect one that would beat Pierre Herme's Plasir Sucre and Four Leaves' Classic Chocolate. And I was not the only one who thinks these are good. For the first time, both Pretty Mum and Little Sis raved so much after tasting them as well. 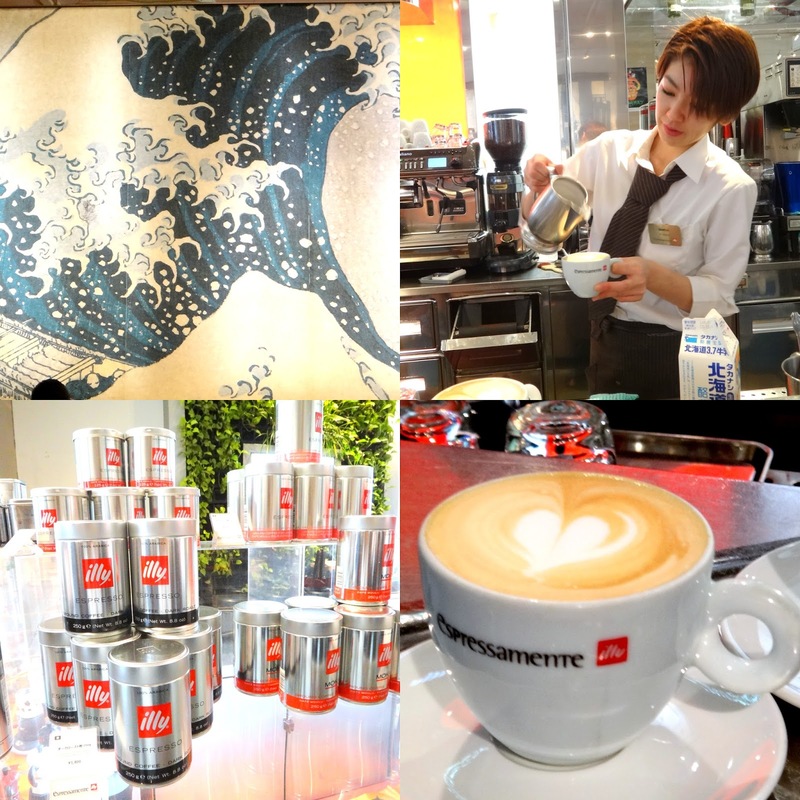 A random coffee break landed us here in this chic coffee franchise along Ginza streets. Alongside with its coffee, there is also a wide range of sandwiches and pastries. But one thing that is unique to Illy outlets is Japan is most probably the Tiramisu (580 yen). Nowadays, I feel that there are very few F&B shops that can sustain the interests of customers. Most people flocked to the latest openings in a bid to be the first to post the food photos on Facebook or Instagram. A hype is created but it often dies down in a couple of months. This trend is very much short-lived and most people hardly re-visit the places once they have "checked out" a place. One example, in my opinion, is FIX. I dropped by recently on a Sunday afternoon to purchase some take-away cakes but the area was barely filled and the service was rather sloppy. It's the time of the year again. Autumn, Maple, Chestnuts, Pumpkin....these evoked the nostalgic memories of cool winter back in Tokyo around 2 years ago. How time flies since my last X'mas spent in Tokyo in 2013. Speaking of the chestnuts, the first thing that comes to my mind is always Mont Blanc Cake. And out of the numerous chestnuts mountains conquered, this globe-shaped Mont Blanc left an indelible impression till today. There is none of that typical wiggles, only a clean smooth outer layer that wrapped a surprising fruit within - Apricot. But what I love more is the award winning Maple Gateau (600 yen) created by Pastry Chef Katsuhiro Nakano for Competition de Gateaux a L'erable, a special maple cake competition. This is a delightful combination of apple cubes, hazelnut and maple sweetness, with smooth and crunchy textures all in one. Nothing too aggressive here, just some sticky sweet autumn aroma that evokes nostalgic blues and remind me that the year is coming to another closure again. I'm a big fan of quiches and pastries in D&D Tokyo but I have yet tried the food in D&D Singapore despite the fact that its flagship store at Orchard Central has opened way back since 2012. Instead of squeezing with the crowd in Orchard, I decided to visit the Far East Square outlet, which offers a quieter and more relaxed ambience to chill out on weekends. Having encountered their huge American sized pastries before, I already had a mental preparation that the servings would be very substantial and none of them proved me wrong indeed. You might be familiar with the more popular names such as Tsujiri or Nakamura Tokichi but in fact, these are just few of the many excellent tea houses in Japan. Another good example is Higashiyama Charyo, one of the tea sweets merchant in Kyoto. Very little has been written about their shop in Kiyomizu Gojyou because online retail is its main business line. Moreover, it appears more frequently as temporary pop-up sweet station in department stores in Tokyo or other regions in Japan. Tucked in the corner of the second floor of this new multi-complex mall is the second outlet of Oriole Coffee + Bar, which boasts a homely atmosphere for anyone looking to sit back and enjoy a good cuppa or a quick bite. The menu has a smaller selection than the one at Pan Pacific but there are several items here that are exclusive to this outlet. Ah Wing Wanton Mee @ Empress Road Market : Worth the Queue! 1,2,3,4,5,6,7,8,9....there was at least 9 people queuing in front of me for the Wanton Mee. But it was not because the owner was slow in preparing the food. It was probably because almost everyone was ordering at least 3 plates or taking away a few packets of wanton Mee/Hor fun at a go. Opened in 1999, the stall is run by a husband and wife who came from Hong Kong and thus they frequently converse in Cantonese with customers unless you speak Chinese or Ang Moh to them. In fact, I am not surprised that their regular customers include our Ambassador-at-large of Ministry of Foreign Affairs, Professor Tommy Koh. He actually listed this and the Rojak place in his ST Times interview and the Rojak recommendation was fantastic! Walking through the sweets section of a department store in Tokyo is always a happy and hated affair for me. 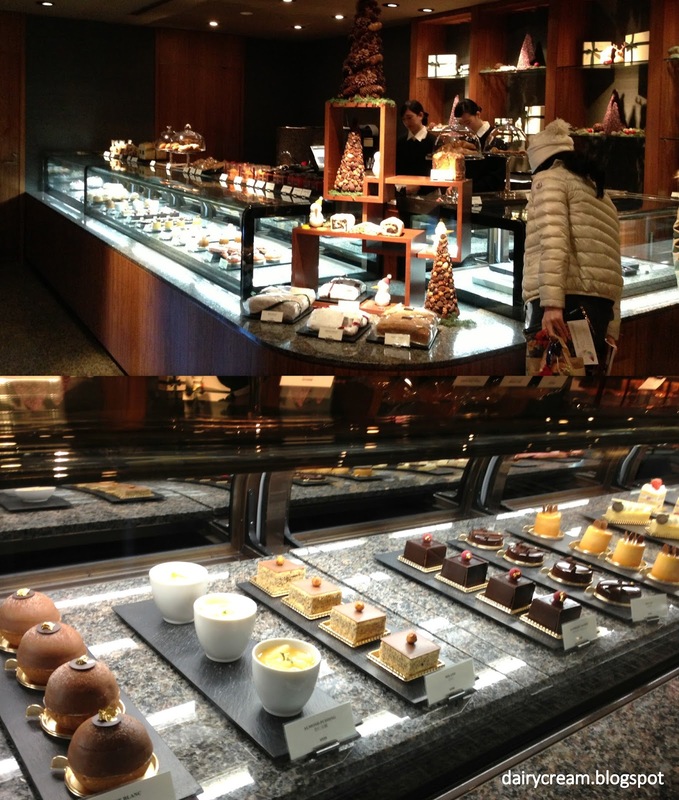 I love to browse and drool at the pretty pastries, yet I know my stomach is not an endless pit to fill them all. Some things turned out better when you have less expectations from them. Renowned for their ultra soft cream cheese cranberry bun, Barcook Bakery offers sliced cakes at some of its outlets but it did not come to my mind to try them until recently when I dropped by their cool and spacious OG outlet. 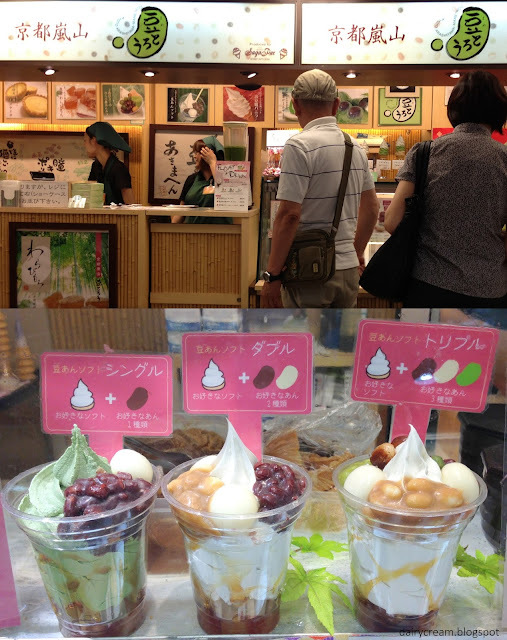 The Classic Choc ($4.90) was sold out so we settled for the Green Tea Cheese ($5.80). As expected, the green tea flavor was not assertive and the digestive base was soggy. However, it fared well as a cheesecake, which is rich with a nice savory tang. The white layer of honey citron cream was quite an uncommon pairing and it imparted a zesty bitterness to the cake, though the sweetness went out of control here. Probably the coolest and richest custard pudding I've ever had. Unlike the Pocky Men's that aimed to target the male consumer market, I think Marlowe's pudding reaches across both genders despite the stark print of a handsome Mafia/gangster icon on the beaker glass. Unless you head to their main shop in Kanagawa, you need some luck and patience before getting your hands onto this pudding because Marlowe only appear as pop-up stalls in department fairs. The pudding is so popular that there is always a snaking queue without fail. It has even been reported that Marlowe sells up to 2000 puddings a day!